DigiTile is a port of DigiQuilt to an interactive tabletop. Like DigiQuilt, it is a construction kit (Resnick et al., 1996) for learners to design pattern tiles / patchwork quilts. Users arrange smaller coloured tile pieces into a coherent whole, based upon their preferences and prepared challenges (e.g., build a tile that is half red). In the process, they engage concepts of proportions, fractions, symmetry, and art. 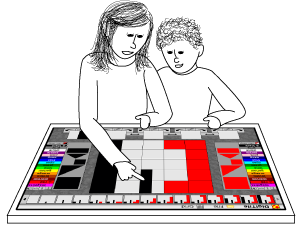 Pedagogically, both DigiQuilt and DigiTile follow Papert’s (1991) theory of constructionism, which holds that people learn particularly well when they are constructing a personally-meaningful public artifact. The end products of the design process are engaging and the learners take pride in showing their tiles to their peers, teachers, and family. Tiles can be printed out to be displayed on the classroom wall or reappropriated, for example, for wrapping paper. DigiQuilt is a desktop application designed for a single user (Lamberty, 2007); DigiTile is an interactive tabletop application, explicitly designed for multiple concurrent users (i.e., learners work together to assemble the tile). As such, the research on DigiTile focuses on the value of interactive tabletops to support co-located collaboration: How do learners work together using this novel technology? How does collaboration change the nature of the construction task? Pedagogically, the transition to multiple users was motivated by Roschelle’s theory of convergent conceptual change. Roschelle (1996) showed how two novices could work together with an inquiry tool to achieve a better understanding than either came into the activity with. To understand what their partner was doing, it was common for novices to ask that partner to articulate what she wanted to do and why. If the proposed theory did not entirely make sense, it could be challenged. The inquiry tool then allowed learners to test their hypotheses. Through an iterative inquiry process, the learners’ understandings begin to converge, not only with each other, but also with the concepts embedded in the inquiry tool. Because DigiTile is reflective (e.g., it automatically calculates the fraction of the tile that is a certain color), learners can use it as such an inquiry tool. DigiTile is also the first interactive tabletop application developed in Squeak, an open-source cross-platform highly-flexible development platform. By building on our experience with DigiTile, we aim to create a suitable framework / library for creating further interactive tabletop applications in Squeak. Lamberty, K. K. (2007). Getting and keeping children engaged with a constructionist design tool for craft and math. Unpublished doctoral dissertation, Georgia Institute of Technology, Atlanta, GA.
Papert, S. (1991). Situating constructionism. In I. Harel & S. Papert (Eds. ),Constructionism (pp. 1–13). Ablex. Resnick, M., Bruckman, A., & Martin, F. (1996). Pianos not stereos: Creating computational construction kits. Interactions, 3(6), 41–50. Roschelle, J. (1996). Learning by collaborating: Convergent conceptual change. In T. Koschman (Ed. ), CSCL: Theory and practice of an emerging paradigm (pp. 209–248). Mahwah, NJ: Lawrence Erlbaum Associates. Unzip it and a DigiTile directory will be created. To start DigiTile, start the ‘Squeak’ program inside the DigiTile folder. 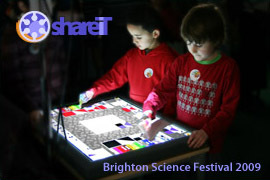 Note: As this program was created for a multi-touch table, the menus are a bit unconventional. You launch them by clicking on either button in the bottom-left or bottom-right corner. From there, you can quit the program, save new tiles, export tiles as GIF images to be shared and printed, etc. DigiTile needs a monitor with a minimum resolution of XGA (1024×768).